Advanced microgrids were still something of a bet four years ago when Schneider Electric and partners rolled out the Oncor microgrid in Texas, an early demonstration project. 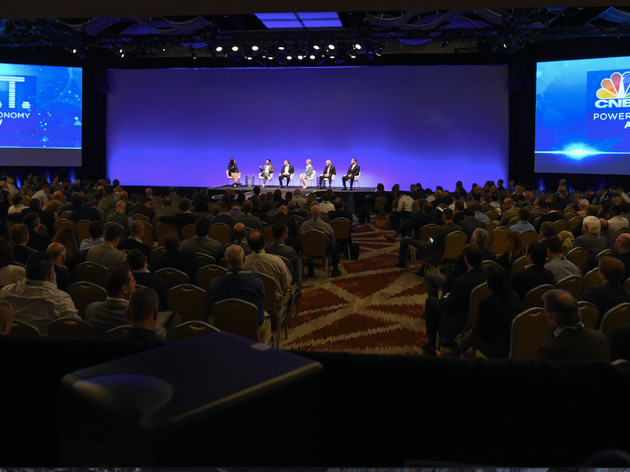 Tiptoeing into microgrids then, the energy management and automation giant now is in full stride, made clear this week at its Innovation Summit North America in Atlanta, Georgia. Top company brass have their eyes on the microgrid market. Chairman and CEO Jean-Pascal Tricoire featured some of the company’s advanced microgrids as he highlighted various Schneider success stories during his opening remarks. “You’ve got powerful catalyzers of change here in the electrical system, which are pushing the grid to be richer at the level of the edge, closer to the consumption,” Tricoire said, to an audience of 1,200 companies, buyers, analysts and others tracking Schneider’s business, which netted $28.5 billion in revenue last year. Tricoire described microgrids at the Marine Corps Air Station (MCAS) Miramar in San Diego, California and in Montgomery County, Maryland, two large and sophisticated projects. But they soon became old news when two days later Schneider unveiled another microgrid project, the latest in a string of announcements. The new microgrid is for Bowery Farming, a New York company that offers indoor agriculture. 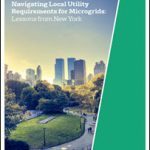 The Bowery Farming microgrid emerged out of Schneider’s strategy of partnering with smaller microgrid developers and local electrical contracting companies to reach into local markets. “We can’t call on every small building to make an offer,” said Mark Feasel, vice president, electric utility segment & smart grid, in an interview with Microgrid Knowledge. But local contractors are in neighborhood buildings all the time — they see where opportunity lies. So Schneider has launched a program called EcoXpert, which makes available training tools and demos to help smaller companies upskill their work force, create new jobs and tackle more complex projects. By gaining a better understanding of the digital overlays and cloud products being integrated into microgrids, the partners gain a competitive edge, Feasel said. “The electrical contractor has to transform along with this market. In a world where the consumer is no longer passive, their requirements are changing,” he said. Schneider selects the best of the EcoXpert participants as partners for microgrid development. The division of labor can take various forms in the partnerships. For example, Schneider doesn’t necessarily handle the microgrid engineering, procurement and construction; it may relinquish the role to the local partner and instead sell products, software and services. In the case of Bowery Farming, New Jersey-based Scale Microgrid Solutions is originating, engineering, designing, owning, financing, and servicing and monitoring the system. 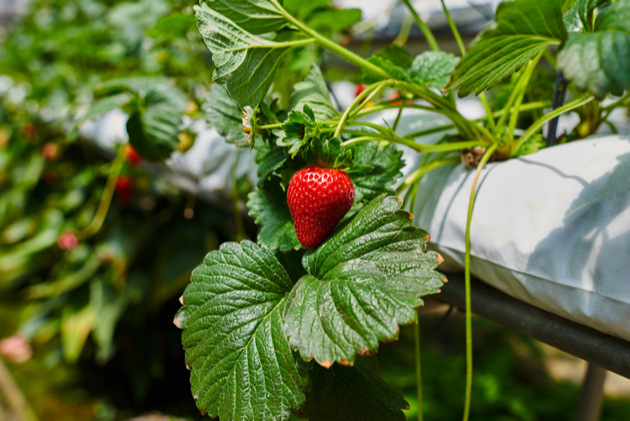 The indoor farming movement melds philosophically with microgrids. Often in urban areas, indoor farms are typically close to those they serve — just as microgrids are. So the indoor farms use fewer resources than agribusinesses in delivering product, creating efficiencies, again as microgrids do. Indoor farms also use less water and crop treatment because they are in contained environments. However, they demand substantial energy for lights, water pumping and other operations. Bowery Farming will improve its environmental profile by using energy from a microgrid that will rely on solar, energy storage and natural gas. Schneider will provide the lithium-ion battery energy storage system, the microgrid controller and a cloud-connected energy management software platform. The indoor farm also gains reliability since the microgrid can island from the central grid during a power outage and rely on its on-site generators. The digital platform orchestrates when to stop and start and when to charge and discharge; it handles forecasting, weather monitoring, and load balancing in real time. The solar can operate when the microgrid is in island mode. At a future date the Bowery Farming microgrid may also gain revenue through demand response and ancillary services. Indoor urban farms tend to occupy buildings that were once used for other purposes. Not long ago, installing a microgrid in that kind of setting would have meant extensive study and engineering. That too has changed for many projects. Microgrids are becoming more standardized and modular, taking a few months — not years — to build, Feasel said. “Microgrids are becoming more accessible to a larger population. It’s due to standardization and a commercial, off-the-shelf approach,” he said. The Bowery Farming microgrid, for example, is scheduled to begin operation in the first quarter of 2019. To simplify microgrids “for folks who don’t wake up everyday thinking about electricity,” Schneider developed what it calls the Energy Control Center, which orchestrates all of the resources within the microgrid. The owner can configure how many and what kind of distributed energy resources it wants to employ in the microgrid, based on pre-defined use cases. For Bowery Farming, the microgrid’s distributed energy are all managed within a simplified panel board. The system is monitored within the cloud by Schneider’s EcoStruxure Microgrid Advisor, a software platform that the company uses for both its small microgrids, like Bowery Farming. and its large ones like the Montgomery County. “Bowery will have the same kind of visualization — a small microgrid for a relatively small price — that someday a big airport might have,” Feasel said. Microgrids for the rest of us? Expect to hear about more new microgrids soon; Schneider says it’s got them coming. Still, the microgrid market is not moving as quickly as it might, Feasel said. For one thing, “there is still too much management by catastrophe,” Feasel said. Companies and communities often don’t consider microgrids until they’ve experienced the cost and pain of power outages brought on by severe storms. For corporations and other large energy users, the microgrid industry encourages pro-active project development by quantifying what power outages will cost them. But it’s harder to do the calculations for smaller operations and neighborhoods. So developers lack data to make an economic case for microgrids to a broad swath of society. Credit-worthiness creates another roadblock. Some customers want microgrids but cannot secure financing. Feasel sees a possible role for electric utilities in helping those customers — but so far state regulators have been slow to allow utility microgrid development. So even as more and more microgrids come on line, “there is still a real question of how do we make this transition work for everybody,” Feasel said. Track news about Schneider Electric and its microgrid play. Subscribe to the free Microgrid Knowledge newsletter. I have been involved in engineering education and research all my life. I am especialised in electrical power and electrical machines. I got my B.Eng. and Ph.d. from the University of Liverpool, U.K. in the sixties ! and spent one year of sabatical training on digital electronics at Bristl University in 1975. In our developing country, Sudan, the electrical power supply is very insecure. So I have foreseen for more than 12 years ago that the only possibility to produce a sustainable power supply is by using distributed electrical power generation. Moreover the available solar energy is tremendous. So I supervised a Ph.D. research work on Dispersive generation & utility connected converters, and we published a book with the same title in Amazon. So I find your Microgrid Knowlege information of great interest to me, specially after my intent to settle in USA as a lawful Permenant Residant after we received the Green Card.